See catalog No. table above, select ACA’s by height of plank grating. Clamp prevents grating from shifting on supports. Holds pieces together with or without clearance between panels. 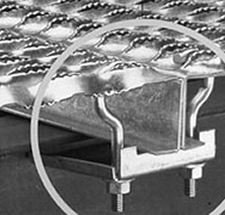 All bolts are below top surface of grating and no holes are drilled in supporting members. Assembly consists of (1) anchor plate, (2) 3/8” J-bolts, (2) 3/8” hex nuts, and (2) 3/8” flat washers all electro zinc plated with standard finish hot dip mill-galvanized before fabrication. Special Order Option: anchoring device can be cadmium plated. Align two planks side by side on I-Beam or other anchoring cross-member. 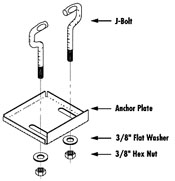 Place J-Bolts in openings opposite each other (nearest to the inner edge of each plank). Slide ACA anchor plate up J-Bolts until snug. Make sure the inside edge of the ACA anchor plate is as close as possible to the center of the cross member. Tighten nuts until planks are secure.